Travel on board the Anakonda Amazon River Cruise, the only luxury ship cruising the Ecuadorian Amazon Rainforest, and experience the Amazon in a most unique way! Visit the remote and pristine areas where few have had the opportunity to travel, and interact with the region’s 15 local communities, while enjoying the comforts, commodities and services of a 5-star boutique hotel on board with us in the middle of the Ecuadorian Amazon. Let’s cruise the Amazon Jungle on board the Anakonda! All about the Anakonda Amazon River Cruise. After lunch, the M/V Anakonda navigates to one of the most pristine and little explored sections of Ecuadorian Amazonia, home to the legendary pink river dolphin, black caiman and anaconda. We may also find river turtles and various species of monkeys, as well as the primitive Hoatzin, a one-of-a-kind bird locally known as ”the Stinky Turkey”. The only way to actually visit this flooded ecosystem is by canoe, a ride that will reveal the beauty of a lush jungle world. SAFETY: GPS tracking by the Ecuadorian Navy, Radio communication with separate battery pack, satellite phone, life jackets, flares and signals, fire extinguishers, sprinklers and smoke detectors in each cabin, automatic defibrillator on board. CREW: 25, including a purser, paramedic, 4 English-speaking naturalist guides, 4 native guides, Captain, concierge and crew members. 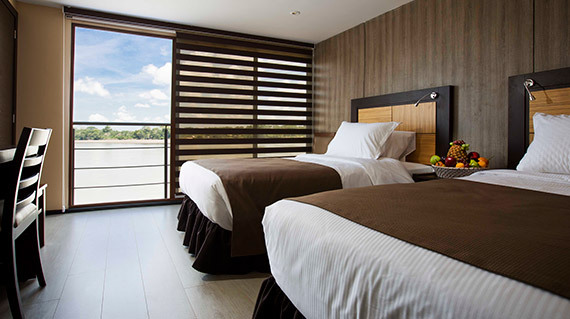 The Anakonda Amazon River Cruise is the only luxury cruise liner in the Ecuadorian Amazon Rainforest. 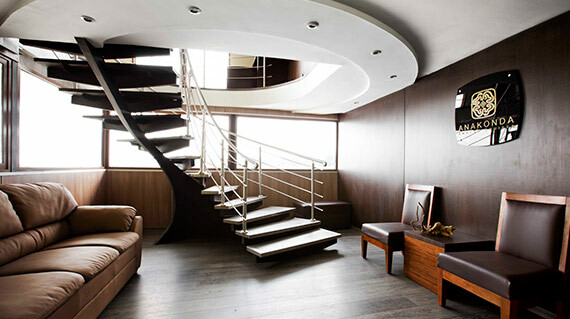 Its 18 suites each with an area of 215-258 square feet, are equipped with air conditioning and 24-hour electricity, each with a private bathroom with hot water and all necessary amenities, allowing our guests to enjoy their cruise with nothing to worry about. 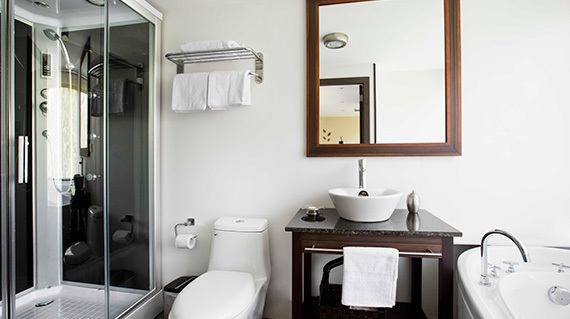 To accommodate families, Anakonda offers four interconnected suites. Passengers can socialize in the dining room, bar, observation deck with outdoor Jacuzzi, and in the al fresco lounge. There is also a small boutique where one can purchase souvenirs, or perhaps some vanity products that may have been left behind at home. Our guests will be assisted by our 25-person crew, including a concierge, purser, paramedic, 4 skilled nature guides, and 4 local guides. 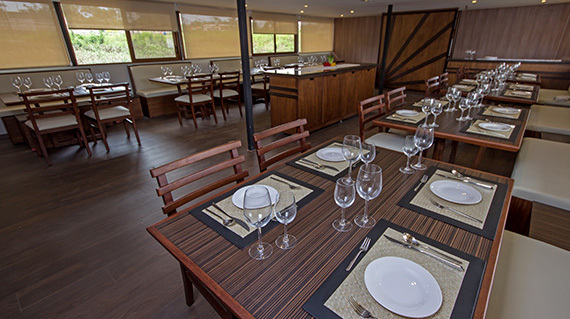 Travelers on board the Anakonda Amazon Cruises will enjoy a wide variety of national and international fusion cuisine. We take traditional and well-known cuisine from all over the world and adapt it using fresh, local products. 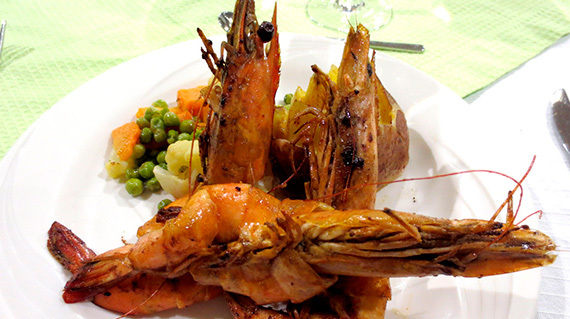 It’s not unusual for our guests to enjoy unique fare such as Quinoa Risotto or fish prepared in coconut sauce. The Anakonda Amazon River Cruise operates year round. Every trip is unique, based on the changing seasons. During the high water season, when the water levels of rivers and inlets grow, launch boats are able to venture deeper into the flooded forest. During the low water season, the river recedes to form beautiful sandy river beaches. The Anakonda Amazon River Cruise departs from the port city of El Coca, Ecuador. Coca has 3 daily flights from Quito, Ecuador’s capital. The flights are 45 minutes.